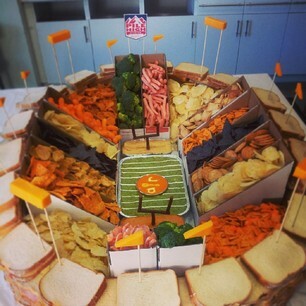 The snack stadiums are popping up everywhere these days. 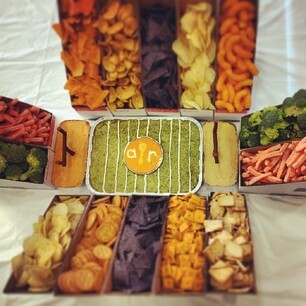 Football fields filled with guacamole, hummus, and nacho dips, surrounded by chips, crackers, sandwiches, and maybe carrot sticks and celery sticks for a healthy measure. Of course, we at Allrecipes.com had to build our own. It was certainly a team effort from planning to assembling, to recording. And how fun it was! No worries, we donated most of the leftovers from the stadium and made lots of hungry people happy. Ready to build your own? Take inspiration and direction from our video.